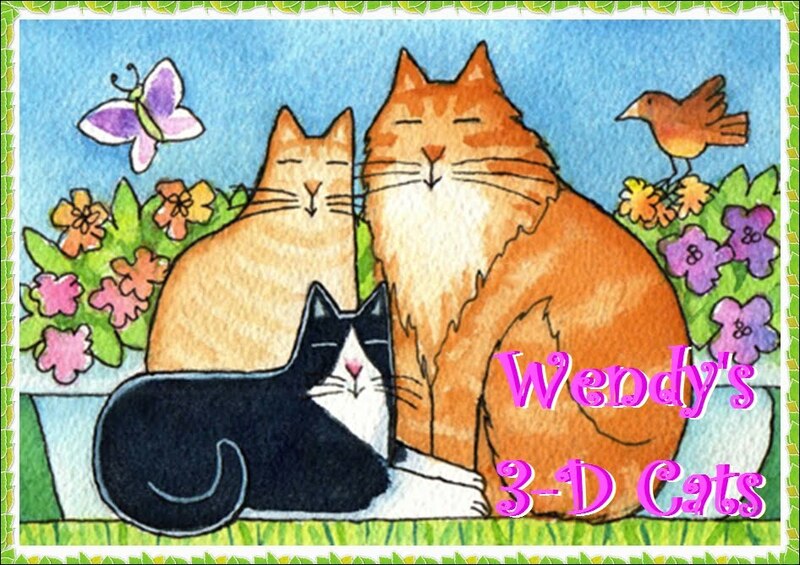 Wendy's 3-D Cats: THE 3-Ds AND THEIR MATES WISH YOU A VERY MERRY CHRISTMAS! THE 3-Ds AND THEIR MATES WISH YOU A VERY MERRY CHRISTMAS! The 3-Ds are off this evening. Each of them is flying out, by various means, to see their signifiCAT others. 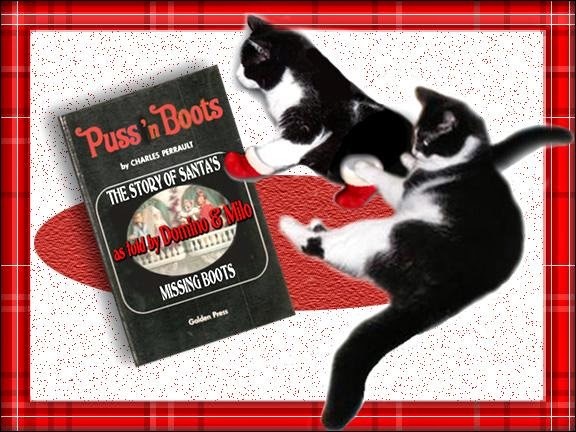 Domino is flying high, across the pond, to see her longtime sweetheart, Milo who lives in the Cotswolds in England. 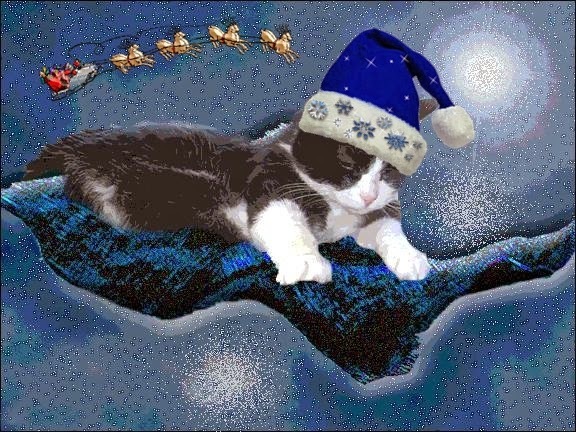 ... waiting for Santa to arrive. 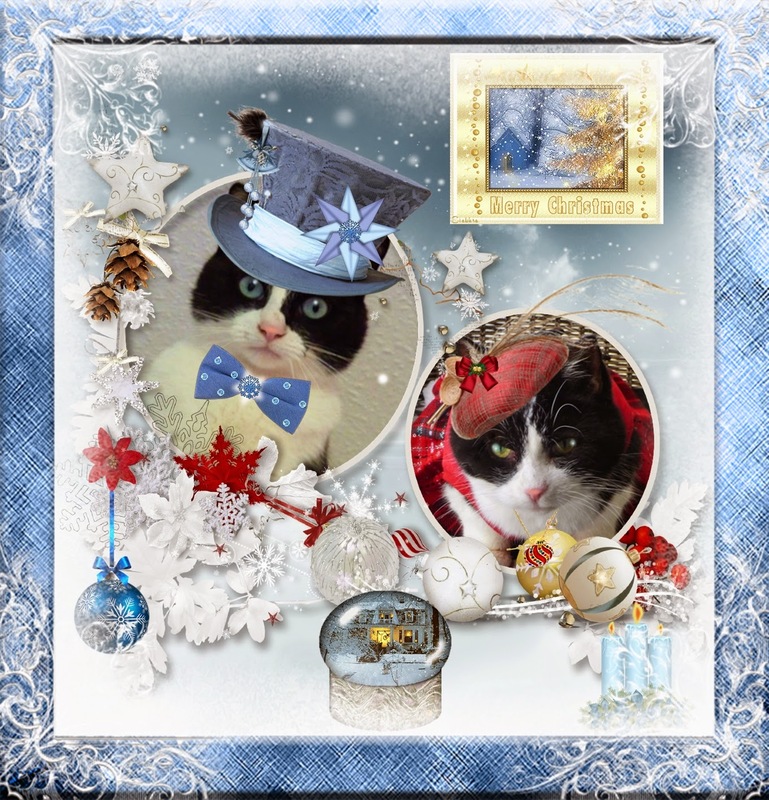 Here is Domino and Milo's official Christmas portrait for 2014 for all of you to enjoy. They sure do capture the Christmas spirit! Dylan is hitching a ride on Santa's sleigh along with all of the other reindeer. He has cleverly disguised himself as one of them. He intends to jump ship (or sleigh in this case) once they hit Louisiana where his fiance Halle lives with her family. After Santa had come and gone, leaving them lots of goodies behind to enjoy later, Dylan and Halle thought they'd have some fun outside in the snow. It was a gorgeous moonlit night and the snow was falling gently. So they decided to build a snowman together. They can accomplish just about anything when they work as a team. Afterwards they came inside to this beautiful sight! Halle went to get some warm milk for them both while Dylan conked out by the fire. And all they have to do is look out the window if they want to see the snowman built-by-two! 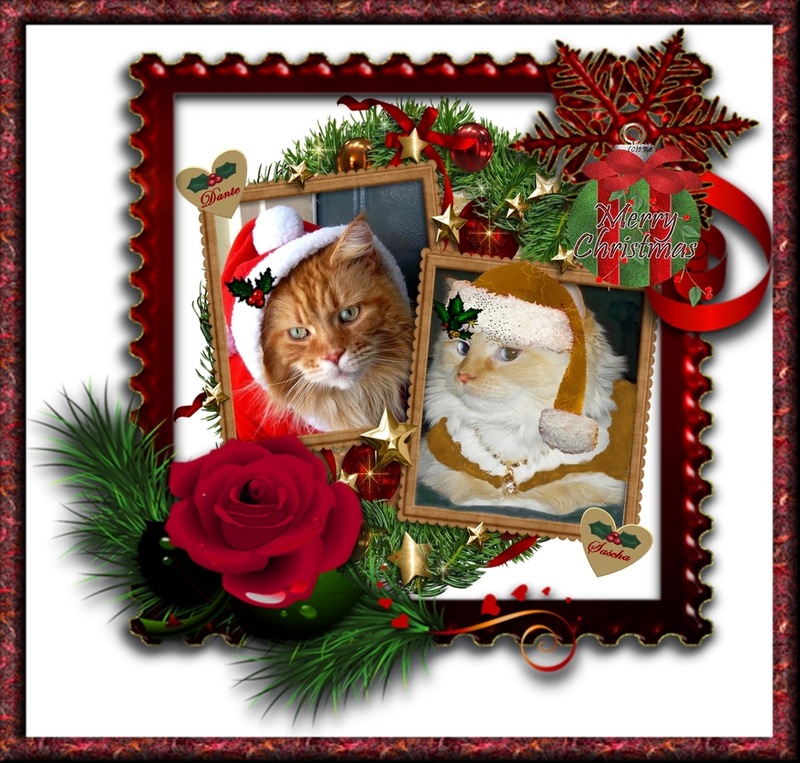 Here is Halle and Dylan's official Christmas 2014 portrait. Don't they make the PURRfect pair? Dante travelled 'over the moon' to see his beautiful fiance, Sascha. She met him there so they could be 'over the moon' together. 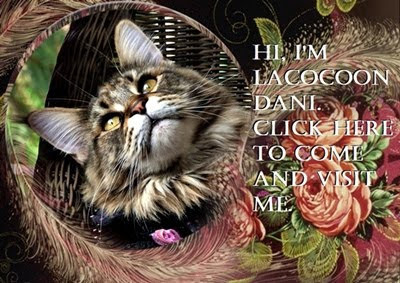 Then Sascha led Dante back to her house and warmed up the fireside chair for them to share. 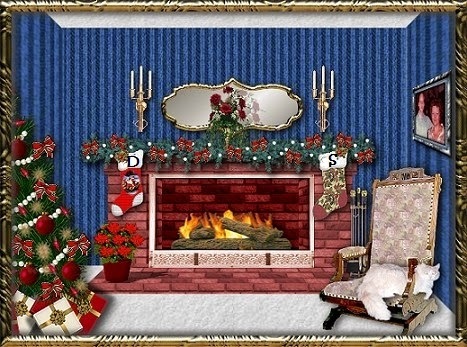 She has hung their stockings on the mantel, and they, too, are cuddling up to wait for Santa to make his grand appearance. Luckily, Santa brought lots of toys for efurryone, because Sascha has five sisfurs and a brofur at her home in South Carolina. 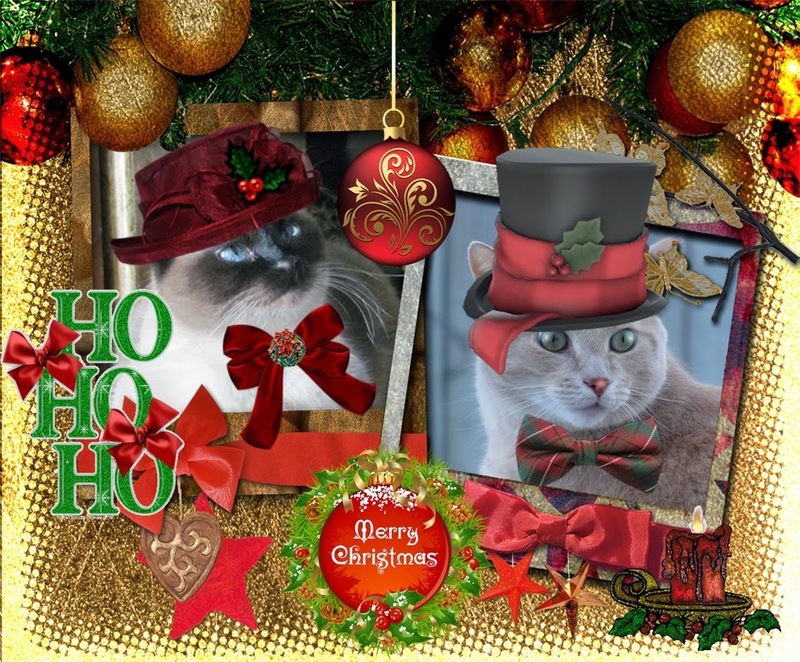 And here is Dante and Sascha's official Christmas 2014 portrait, too. They are two of Santa's biggest fans! 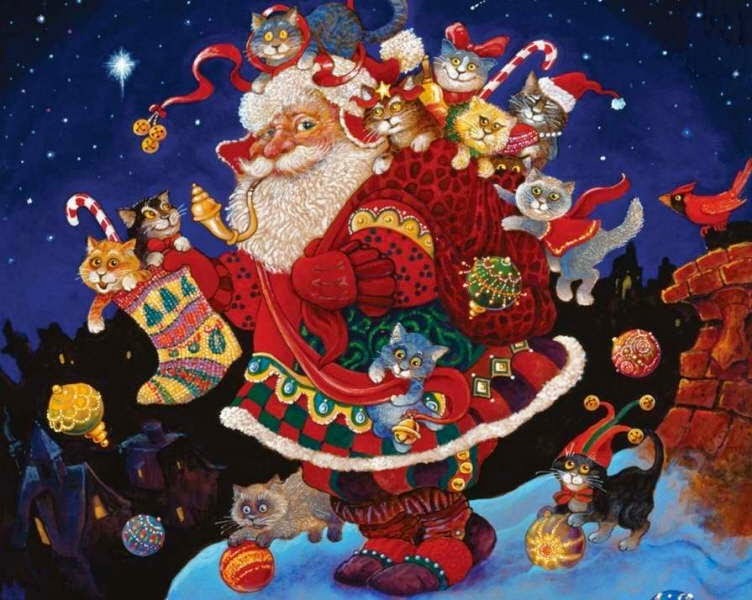 So from all of us, and our loved ones, to all of you and yours, have a Very Merry Christmas Friends! DANTE AND DOMINO ARE MR. AND MRS. CLAWS! 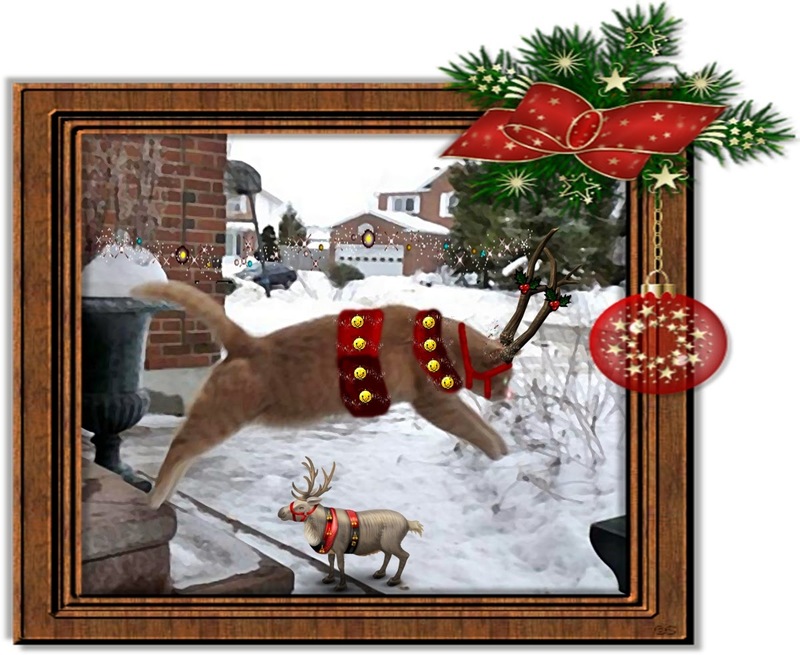 3-D WORDLESS WEDNESDAY: WELCOME TO DECEMBRRRRR!